Sunday night open climbs will be reduced to a max capacity of 10 people (from 20) between April 14th and July 14th 2019, due to show rehearsals happening at the same time. Be sure to sign up ahead of time if you want to secure your spot! 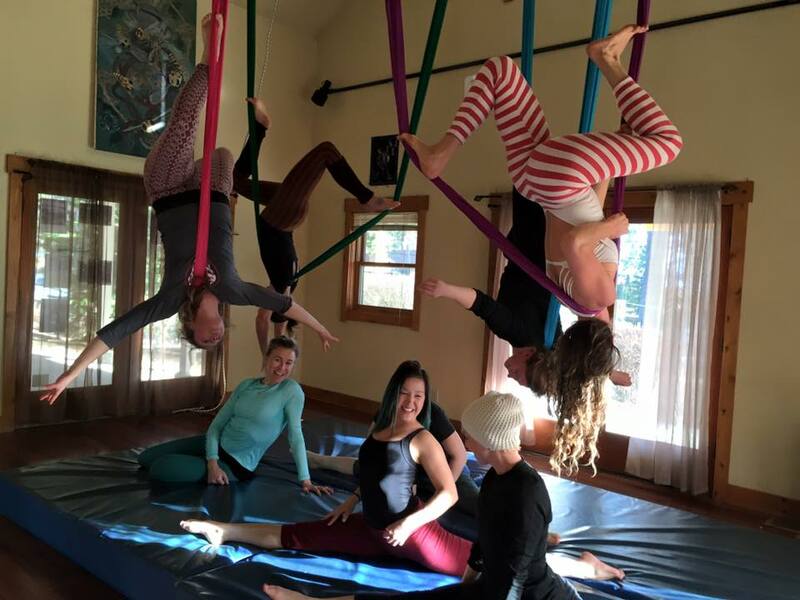 When learning the aerial arts, whether through determination to become a professional performer, or if you are simply excited to challenge your body, meet cool people and have some playtime in your life, you have to practice in order to get better. We would rather provide this space for you, than for you to hang up your own equipment on a tree in your backyard! It's safer, and you'll have knowledgable supervision. Open climb is a committed play time. It is available to anyone, 16 years old or over, who is currently enrolled in classes or with prior approval from an instructor. If you haven't taken a class with us, we will require you to pass an aerial conditioning test, so that we can be sure your skills are at a level where you can work alone, and that you are strong enough to stay safe. Please arrange this with us via the contact page before arriving at open climb. We need 24hrs notice before you plan to attend open climb to arrange this. We also welcome aero-yogi's and other floor-utilizing movement friends :) Admission for floor-only use is just $5! Although open climb is supervised by at least one instructor, we are not watching each individual all of the time. YOU ARE RESPONSIBLE FOR YOURSELVES! We ask that you do not experiment during open climb, or teach each others moves they do not already know. You must ALWAYS use an 8" crash mat. This is not a teaching time - please do not expect that you will be guided through your training by being at open climb. We may also be using this time to practice, stay fit, or rehearse for performances. You must be 16 or over, or under prior-arranged instructor supervision. No glass at all in the gym! Learn through play and connection! $10 Drop In (to use aerial equipment) or $5 with an active Aerial Class-Pack!